I am an admitted chocoholic, especially when it comes to dark chocolate. Whether it’s flourless chocolate cake, dark chocolate pecan clusters, or even chocolate covered, peanut butter filled pretzels, once a piece of chocolate crosses my lips, I want more. Not surprisingly, I’m known to only order chocolate desserts at restaurants. Though lately I’ve made a concerted effort to expand my horizons and have been rewarded with things like Mozza’s Torta Della Nonna which I am now in the process of feverishly trying to recreate at home (note to Nancy Silverton and Matt Molina – if you could finish up with that Mozza cookbook, I’d really appreciate it. Thanks). Also not surprisingly, when I’m cooking at home I tend to be drawn to dessert recipes that call for chocolate. So, why isn’t this a post about a recipe for a chocolate dessert? Because I happen to be in a relationship with someone who loves carrot cake the way I love chocolate and in my never ending quest to please both our palates, I have a hard time passing up any carrot cake recipe that comes my way. This particular version comes from the latest issue of Everyday with Rachael Ray. The addition of crushed pineapple makes for a very moist cake and in a deviation from tradition, the frosting calls for sour cream. It’s a nice change from the usual cream cheese and the tang the sour cream imparts is a great compliment to the carrot cake. I have yet to hear what the carrot cake fanatic thinks of this recipe since he won’t get the chance to try it until tonight, but I think it’s a definite keeper. If you can’t get over the absence of cream cheese frosting, try the cake recipe and top it with your favorite frosting. I think it would be equally delicious. One final note - The next time I make this recipe I’m going to double it. My bundt pan is clearly larger than a 6-cup capacity and the more cake I’m left with on this one, the better. Grease a 6-cup capacity bundt pan and set aside. In a medium bowl combine the flour, baking powder, baking soda, cinnamon and ¼ t salt. In a larger bowl, combine the brown sugar, ¼ cup of sour cream, the vegetable oil, egg and vanilla and whisk until smooth. Add the carrots, walnuts and pineapple and stir until combined. Add the flour mixture and stir just until combined. 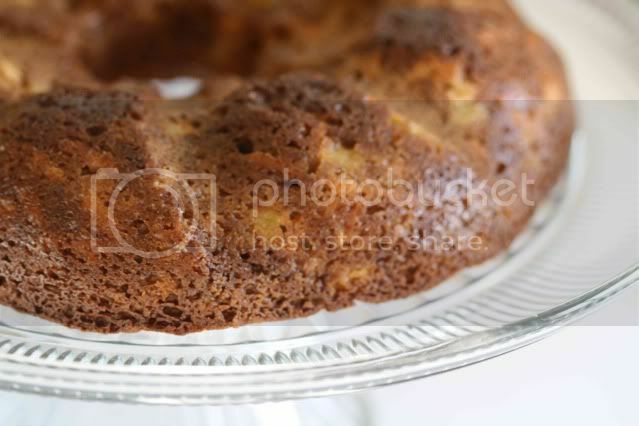 Pour the batter into the prepared bundt pan and bake for 55 minutes or until a toothpick test comes out clean. Let the cake cool for 15 minutes in the pan before inverting onto a wire rack to cool completely. Use a wooden spoon to combine the powdered sugar and butter. Whisk in the remaining ¼ cup sour cream and pinch of salt. Pour the frosting over the cake and dust with cinnamon if desired. We celebrated my son's 30th BD at Mozza last November. Loved it! I can't wait for the cookbook either! Your carrot cake looks good. We just baked carrot cake in Sweet Melissa Sunday's last weekend. My wife is a huge fan of carrot cake, though at our wedding our cake was made with pineapple and she didn't like it as much. I love carrot cake with the pineapple. I'm interested in trying the sour cream icing with it. I liked carrot cake, but didn't love it until I moved to the South. I have to say all the cakes taste better here. Sour cream is an interesting twist on the usual cream cheese frosting. A place near me makes a great carrot cake, and they sprinkle the top of the frosting with turbinado sugar. Makes a nice bit of crunchiness! I love carrot cake. Your partner is very lucky to have you making carrot cake when your heart belongs to chocolate! Lovely! I've been on the hunt for the perfect carrot cake recipe for my Best Friend's upcoming 30th birthday. I have a carrot cake recipe that is made with honey, including in the frosting..but I think I may need to make two test cakes now! Sour cream frosting sounds too good to pass up. I'm a carrot cake lover in a relationship with a chocolate lover, so I sometimes have to make choc cake for him! I love a good carrot cake. What appeals to me about yours is that it does not use much oil. I guess that is where the pineapple compensates with the extra moisture. Interesting twist. I love chocolate. I also love carrot cake! sometimes it's hard to decide which I love more (chocolate normally wins). Sour cream for the frosting? Amazing! I'm not the hugest fan of cream cheese frostings so this is right up my street. My favorite carrot cake recipe has pineapple in it, too. I'm excited about the sour cream frosting idea, as I can't get cream cheese here, but crème fraîche is abundant! Sounds pretty darn good! 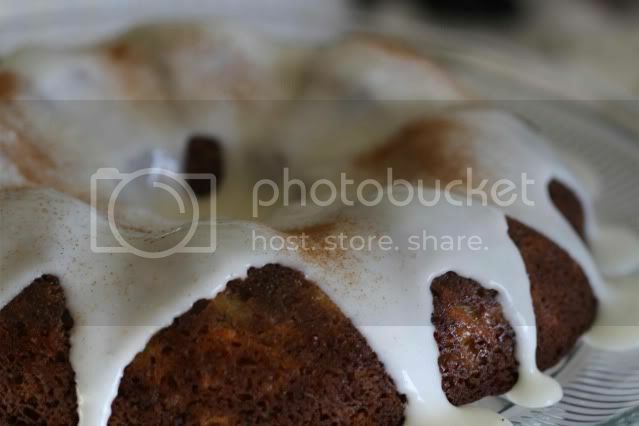 I love carrot cake and I especially love anything I can bake in my bundt pan! I never thought of doing a carrot cake as a bundt cake. Sounds delicious!